As hardware components continue to get smaller, more powerful, and more efficient, so the gaming laptop goes from strength to strength – these days it's perfectly possible to get a portable computer that can play top-end games, but which doesn't also weigh a ton. 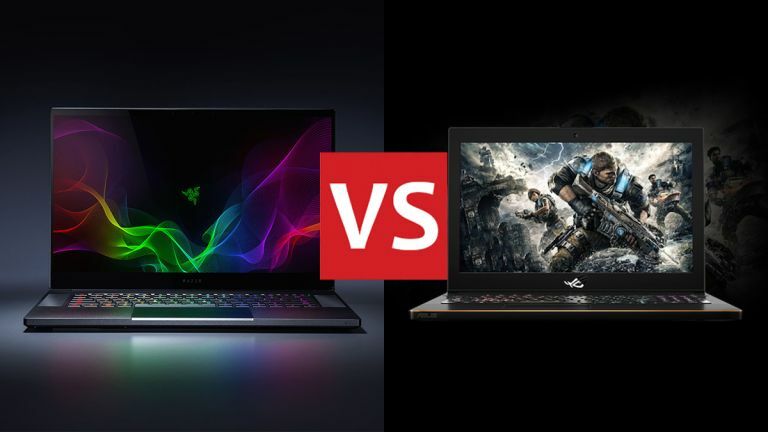 Here we're going to carefully compare two of the very best gaming laptops on the market at the moment: the Razer Blade and the Asus ROG Zephyrus M. Which has got the performance, the specs and the design to be crowned the winner? Read on to find out. Take a look at the brand new, 15.6-inch Razer Blade laptop and you can instantly recognise its aesthetic appeal – with super-thin screen bezels, a resolution of up to 4K (3840 x 2160 pixels), a compact aluminium chassis with a black anodised finish, and subtly colourful backlights on the keys, this is going to wow anyone who slaps eyes on it. In the other corner the 15.6-inch, Full HD (1920 x 1080 pixels) Asus ROG Zephyrus M is by no means a bad-looking device either. We're impressed by the modern and stylish design of the laptop, all metal and angles and subtle coloured highlights. The brushed aluminium finish and copper trim add an extra touch of class too. At a maximum thickness of 17.3 mm (or 0.68 inches), the Razer Blade is just a touch thinner than the Asus ROG Zephyrus M at 19.9 mm (or 0.78 inches), but obviously there's very little in it. At 2.15 kg (4.7 pounds) the Razer laptop is also a shade lighter than its Asus-made rival, which tips the scales at 2.45 kg (5.4 pounds). We'd award high scores to both these laptops in the design department, though of course a lot of it is down to personal choice – you might prefer one or the other because of your particular tastes (that large heatsink above the Asus ROG Zephyrus M keyboard can take some getting used to, for example). Besides the display specs we've already mentioned, you can pick up both these laptops in a variety of configurations. As always, the more power and performance you want, the more you're going to have to pay: of course when we're talking about two of the best gaming laptops on the planet, even the entry-level specs are quite something. The Razer Blade can be tricked out with up to an Intel Core i7-8750H processor, an Nvidia GeForce GTX 1070 with 8GB of graphics RAM, up to 32GB of system RAM, and up to 512TB of storage with an integrated SSD. In the other corner, the Asus ROG Zephyrus M maxes out at an Intel Core i7-8750H for the processor, an Nvidia GeForce GTX 1070 with 8GB of RAM for the graphics, up to 32GB of system RAM, and up to 1TB of on-board SSD storage. A variety of other configurations are available below those two high watermarks, and as you can see there's very little to choose between them. It's pretty much even at the top end, though the Asus computer has some bigger storage options. What's clear is that you can play any games you like at whatever settings you like on either of these machines. Besides the design and specs of these two laptops, there are plenty more features we can talk about too. With the Blade and Zephyrus M broadly comparable in terms of the specs you get, it might be one of the extra bells or whistles that tempt you into purchasing one or the other of these computers. Asus has what it calls an Active Aerodynamic System (AAS), for example, which improves air flow inside the chassis of its laptop and means you can game for longer with quieter fans, because there's less heat on the processor. There's also Aura Sync for personalising the lighting on the keyboard, and syncing it up to the action on screen. Meanwhile the Razer laptop offers you custom-made fans and a "vapour chamber" system for dissipating heat and keeping the computer cool at the same time. There's also Razer's own lighting customisation software, so you can personalise the way the keyboard looks to suit your own tastes (it works with the Razer Chroma system too, so you can even sync up your room lights). For ports, you've got one USB-C, four standard USB, one HDMI and one microphone/headphone port on the Asus ROG Zephyrus M, while the Razer Blade comes with one less standard USB socket and an extra Mini DisplayPort connector. Like a lot of our other comparison metrics, there's not much to choose between these laptops in terms of available ports. With so many different configurations on offer, not to mention discounts and sales applied by retailers, it's difficult to make a definitive statement on the prices of the Razer Blade and the Asus ROG Zephyrus M. You should be able to get a good idea of current prices through the latest deals embedded on this page. At the time of writing, get the Razer Blade direct from Razer and you'll pay between £1,699.99/$1,899.99 and £2,549.99/$2,899.99, depending on the spec you go for. In comparison, the Asus ROG Zephyrus M can be had from between £1,749.97/$1,999 and £2,799/$2,629.99 online, though prices continue to shift. That's a lot of cash, but you do get a lot for your money too. With not much to choose between either of these laptops in terms of power, features or price, it may well come down to which one you prefer in terms of the looks and styling – or maybe which brand you've had most experience with in the past. You won't go wrong with either the Razer Blade or the Asus ROG Zephyrus M – they're arguably the two best gaming laptops on the market right now. As for which one is better, it's a very close call, with only a few individual specs and a few different design choices able to separate them.